Oct. 3, 2018 (EcoSophia.net) -- To my mind, one of the main sources of collective stupidity in modern American society is our pervasive bad habit of short-term thinking. It’s embarrassingly rare for anyone in American public life to stop and say aloud, “Hold it. What’s going to happen if we keep on doing this for more than a few more years?” Now, of course, one of the reasons so few people do this is that those who do get shouted down as impractical dreamers, and the mere fact that the so-called dreamers are so often right, and the practical men of affairs who dismiss them are so often wrong, somehow never inspires the least willingness to rethink the matter. This has been on my mind more than usual of late, as the price of oil ratchets slowly upwards. It’s risen over the last few years from its post-2009 lows to a point at which it’s beginning to strain the economies of third world nations. It’ll strain the economies of major industrial nations, too, because it’s repeating the same cycle that drove the drastic price spikes of 1973 and 2008. Those of my readers who have been paying attention know this song well enough to sing all the verses in the shower. Petroleum is a finite, nonrenewable, and irreplaceable resource, and we’re burning it at a rate of some 93 million barrels every single day. (The next time the media yells about how some new oil field has been discovered with umpty-ump billion barrels of oil in it, divide that by 93 million and see how far it goes.) With each passing year, the hunt for new oil reserves to replace those that have already been exhausted turns up less and less -- at this point, annual discoveries are around 11 percent of annual consumption. In a sane world, we’d be cutting back on our petroleum consumption year-by-year and giving up the extravagant habits of energy use that were briefly fashionable at the peak of the Age of Oil, and we’d be fine. We don’t live in a sane world, though. We live in a world where the only response to the inevitable exhaustion of the world’s oil reserves that anyone’s willing to consider is to keep on consuming, pedal to the metal, while insisting at the top of our lungs that someone, somewhere, has to come up in a hurry with some replacement for the irreplaceable energy resource we’re wasting so profligately. That’s what drives the cycle that’s gearing up for its third leap at the throat of the global economy. It works like this. As petroleum supplies begin running short, the law of supply and demand drives up prices. Speculators then get into the action, as they do whenever the price of anything rises, bidding up prices further than market fundamentals will justify. That triggers a speculative bubble; what’s more, nations that export oil, and have grudges against oil importers such as the United States, take the opportunity to give any available knife a few good twists, driving the price up yet further. The price of oil zooms to previously unthinkable levels, and for a little while, those few people who recognize the absurdity of the industrial world’s energy policies nurture fond hopes that basic common sense will finally get a look in, and people will start to notice that the only way out of the trap we’re in consists of conservation and lifestyle changes. Unfortunately, that’s not what happens. What happens instead is that the soaring price of oil causes demand destruction, which is a fancy name for the process by which people who can’t afford a resource stop using it. The soaring price of oil also makes previously uneconomical sources of oil affordable, and so new sources of supply come on line just as demand drops. That sends the price of oil down, which pops the speculative bubble and sends investors scurrying like cockroaches toward less volatile markets. As a result, the price of oil crashes, though it levels off a good deal higher than it was before the price began rising; whatever alternative energy sources became briefly fashionable during the crisis either go broke or have to be propped up with lavish government subsidies; and everyone goes back to pretending that trying to extract an infinite amount of oil from a finite planet is something other than raw insanity. We’ve probably still got a couple of years before the next major petroleum price spike, and the crash that will follow it. It’s worth noting, though, that 35 years passed between the first price spike in 1973 and the second one in 2008, and it’s pretty clear that the third spike will arrive in much less than that time. It’ll be interesting to see if the intervals continue to decrease at the same ratio -- if, say, the next price spike comes in 2021 and the ratio holds, the one after that will hit somewhere close to 2024, and the one after that in 2025 -- or if some more complex pattern will shape the mathematics of crisis as the Age of Oil lurches to its inevitable end. In the months and years ahead, I plan on discussing that trajectory from time to time and glancing back over the themes that my earlier blog The Archdruid Report covered during and after the last big oil price spike. This week, though, I want to move a good deal further from the short-term thinking I critiqued earlier, and try to fit the turbulence of our age in the broader pattern of world history. 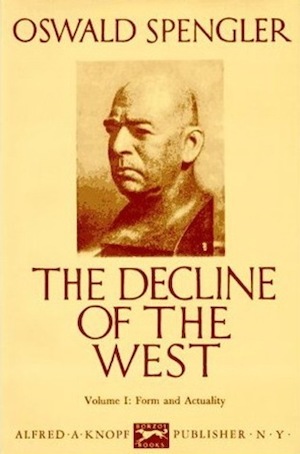 My primary guide in that exploration, as regular readers of my blogs will have guessed already, is the redoubtable Oswald Spengler: historian, polymath, and professional thorn in the side of the comfortable certainties of his era and ours, whose major work The Decline of the West has yielded one accurate prediction after another while the sunnier or more apocalyptic futures predicted by his critics have all proved as evanescent as moonbeams. Drawing on such earlier students of historical cycles as Giambattista Vico, Spengler set out a detailed theory of the morphology of civilizations, tracing them through the stages of a life cycle -- birth, youth, maturity, senility, and death -- that formed the basis for his predictions about the future of Western or, as he called it, Faustian culture. Central to Spengler’s theory, and just as central to the spluttering denunciations leveled at him by the defenders of the conventional wisdom ever since his time, is his recognition that “progress” is a mythological concept rather than a historical reality. Classical civilization -- Apollonian culture, in his terminology -- was not a step forward beyond the mark left by ancient Egypt; what Spengler called Magian culture, the great cultural upsurge in the Middle East that culminated with the Islamic Caliphate in what we call the Middle Ages, was not a step forward beyond Apollonian culture, and our Faustian culture is no more advanced than any of those I’ve named. Does that sound like a paradox? It’s nothing of the kind. Each great culture has its own values and goals and priorities, which it fulfills as well as circumstances permit. Our Faustian culture seems more “progressive” to us for no better reason than because it’s gone further in the direction of fulfilling the values and goals and priorities of Faustian culture than anyone else. Apollonian culture invented the steam engine and the gear train, the two great technological breakthroughs that launched Faustian culture on its way to temporary global dominion, but the Greek and Roman engineers who dabbled in such things didn’t value the things that Gerbert of Aurillac and James Watt did and so didn’t put them to the same uses. Most other great cultures weren’t interested enough in such things even to dabble. Thus it’s an embarrassing bit of ethnocentrism to insist, as too many writers of alternate-history novels have done, that if Western Europeans hadn’t gotten around to inventing steam engines, gear trains, and the rest of the toolkit that made the modern industrial world happen, someone else would have. Our technology is a Faustian technology, shaped throughout by the passions and obsessive ideas of the great culture that was born in western and central Europe around the year 1000; as Faustian culture winds down -- a process already well under way -- its technology can be expected to settle into a static mold, shed those elements that aren’t sustainable, and be mined as a resource by future great cultures, the way Greek logic and mathematics were mined by the Indian, Magian, and Faustian cultures for purposes entirely their own. Let’s take a look off into the future with that in mind, and try to get a sense of what’s likely to happen as Faustian culture finishes settling down into its final stasis. One point that Spengler makes is particularly important in this context. However far afield a great culture may extend its power during its period of imperial expansion, it remains rooted in its original homelands, and once the inevitable age of empire suffers its equally inevitable decline and fall, its far-flung extensions fall away and the original homelands of the culture hold onto what’s left of it until some later culture brushes it aside. Faustian culture had its origins, as already noted, in western and central Europe; in its time of empire, between 1492 and 1914, it surged out of Europe to conquer and pillage most of the planet; though its prestige is still high enough that privileged classes over most of the world still wear clothes of European style and maintain governments of European type, it’s very much a waning power at this point. As a great culture goes into decline, in turn, the places to watch are the borderlands. These aren’t necessarily the political borders, though they can be. As Apollonian culture slid down the well-greased chute of its decline and fall, for example, two border regions turned out to be of crucial importance. One was the eastern border zone where the Mediterranean littoral blended with deserts and then with the ancient cities of Persia and the Arabian peninsula, where Rome’s military power had never reached but its cultural and economic influence was strong. The other was the valleys of half a dozen large rivers that flowed into the North Sea, among them the Thames, the Seine, and the Rhine, where Roman power established itself for a while and then lost its grip as the age of migrations began. Both of those areas proceeded to pup great cultures of their own. In the east, the Magian culture began to take shape long before Rome fell, and succeeded in absorbing the Byzantine empire into its own ambit and cultural forms once the western empire was gone. In the west, where the collapse of Rome had much more drastic impacts, a long and difficult dark age passed before Faustian culture began to emerge. In each case, though, the emerging culture started out borrowing a set of existing forms inherited from an older great culture. Spengler calls this process “pseudomorphosis.” You can see it with impressive clarity in the history of Western architecture, among many other places. The standard building style in early medieval Europe is called Romanesque nowadays, and for very good reason: it looks like a half-hearted copy of Roman architecture. A few centuries went by, and then the pseudomorphosis was shaken off and Gothic architecture soared skyward, at the same time as the first great flowering of Faustian cultural forms in other arts and sciences broke free of Apollonian models. Magian culture had its comparable era of pseudomorphosis earlier, and from a different source. (Spengler disagreed with this, but he was working with a far less complete understanding of Middle Eastern archeology than we’ve got now.) Magian culture originally began to draw together in the aftermath of the Mesopotamian culture, and in its early days it borrowed many of the forms and habits of the grand cultural tradition that had its origins in the mud-brick towns of Sumer. When Apollonian culture expanded east and south into the Magian heartlands -- first under Alexander the Great, then under an assortment of minor Greek-speaking empires, and finally under the eagles of Rome -- there followed a second era of pseudomorphosis, but that was followed by a sharp reaction against the Apollonian influence; eastern Christianity, Islam, and a flurry of less successful faiths such as Manichaeanism surged outward in response, cast aside Apollonian political, cultural, and creative forms, and established the Magian world on their ruins. And Faustian culture? It also had two eras of pseudomorphosis. The first, as already noted, drew on the heritage of Rome; the second, later on, drew on Magian culture. From the Middle Ages to the early modern period, it’s no exaggeration -- though it’s a blow to European pride, no doubt -- to see the quarreling little countries of Europe as simply a western extension of the vast and immensely prosperous Magian cultural sphere, which extended from Morocco to Pakistan. Like the other societies within the Magian sphere, the nations of Europe had established, dogmatic religions from which dissent was permitted only in strictly limited ways, guided by a sacred scripture, centered in a holy city, and expressed in formal congregational worship on a specific day of the week which everyone was expected to attend. These and a galaxy of other Magian customs were standard across Europe -- it’s not accidental that European Traditionalists so reliably turn back to the Middle East for inspiration, since not only the traditions they follow but the entire notion of one true unchanging Tradition handed down from the beginning of time, and only accessible to those who belong to an established religious body, is a Magian invention. Yet that turned out to be a passing phase, just as the Apollonian pseudomorphosis turned out to be a passing phase for the Magian culture some centuries further back. As Faustian culture began to waken to its own possibilities, Magian forms were cast aside or twisted completely out of their original shapes. European master builders who learned Arabic architectural innovations reshaped them out of all resemblance, producing the soaring vertical lines and pointed arches of the Gothic era; monks tinkering with the old Apollonian technology of gear trains reworked it to allow the transmission of power, creating not only the mechanical clock but an essential part of most of the mechanical technology that followed from it; Aristotelian physics got reworked, too, to permit the introduction of concepts of impetus and force that were completely foreign to Apollonian natural science, but essential to the rise of Faustian science. All this would have been difficult to grasp from the point of view of Apollonian culture. Imagine, for a moment, the predicament of a perceptive thinker in late Apollonian society -- say, a Greek philosopher living around 250 CE -- who had grasped the reality of his society’s decline and guessed at the broader pattern of historical cycles in which the decline played one of the standard parts. Our philosopher might just possibly guess that the next great culture in the part of the world he knew might rise out of the eastern penumbra of Roman civilization. His chances of getting any kind of advance notion of the shape of the rising Magian culture, though, were minuscule. To focus on only one detail, how easily could a person raised to think of religion as a matter of traditional rites about which you could believe anything you wanted, so long as you performed them, imagine a religion where belief in a particular set of opinions was so important that people slaughtered one another over minute differences of creed? For that matter, the chance that our philosopher could have anticipated the rise of another great culture out of the northwestern borderlands of the Roman world was probably too small to worry about. In 250 CE, the valleys of the Thames, the Seine, and the Rhine were about as central to the Roman world as the valleys of the Monongahela, the Kanawha, and the Tennessee Rivers are to the modern European world, and the thought that a great culture could emerge from what was then a cultural backwater inhabited mostly by barbarian deplorables would have seemed utterly absurd if anyone had gotten around to thinking of it at all. We’re in a similar situation today, but we have a broader knowledge of history and thus a better chance of recognizing the recurring patterns. The great culture that is settling into its static form, and will play a greatly diminished in the wider history of the world thereafter, is Faustian culture -- the great culture that rose in those northwestern borderlands of Rome in the wake of the Dark Ages, contended with Magian culture as that latter passed its own zenith and settled into its static condition, and then surged out across the globe to conquer most of the planet’s land surface and impose its idiosyncratic cultural fashions on nearly every society on Earth. Like the Apollonian culture, Faustian culture also has two major borderlands, one to the east of its heartlands, one to the west, and from those we can probably expect the rise of two more great cultures in due time. There may be others as well, for the spread of European empires around the globe in the 18th and 19th centuries has imposed its own pseudomorphoses on most of the world; as a result, West Africa and certain regions of Latin America strike me as very likely to pup high cultures in the millennium ahead; but for the moment, for reasons that will become clear as we proceed, I want to talk about the two border regions already mentioned. Those borderlands? Today we call them Russia and America: specifically, as we’ll see in the next post in this series, European Russia west of the Urals, especially the region centering on the Volga valley, and North America west of the Appalachians, especially the region centering on the Ohio valley and the Great Lakes. The parallels between Apollonian and Faustian borderlands go surprisingly deep, because something like the same difference in age that shaped the relative histories of the Magian and Faustian cultures seems likely to shape the equivalent trajectories of the Russian and American cultures to come. Russia passed through its first pseudomorphosis a good many centuries back, when it absorbed potent cultural influences from the Byzantine Empire, at that time an important part of the Magian cultural sphere; it began its second pseudomorphosis in the days of Peter the Great, when a new set of cultural influences from the Faustian west swept over Russia; and it’s currently in the early stages of the inevitable reaction, which will see both the Byzantine and the European influences give way to the first bold statements of a distinctively Russian high culture. I expect that to begin sometime in the 22nd century. America, by contrast, received what Magian influence it had at second hand, by way of Magian elements retained by Faustian culture, and its first pseudomorphosis began in the early 17th century when the first waves of European settlement surged across a landscape mostly depopulated by the cataclysmic impact of Old World diseases on the native peoples. The second pseudomorphosis hasn’t happened yet, and it’s an interesting question which of the rising cultures of the next millennium will be responsible for that challenging stimulus. It’ll be after the second pseudomorphosis sparks the inevitable reaction that the first bold statements of a distinctively American high culture will appear, perhaps in the 26th century. And the general outlines of those high cultures of the third millennium? We’ll discuss that in the next post in this series.